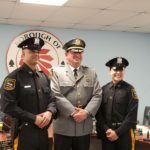 Netcong Borough is proud to announce the addition of two new police officers: Richard Bardini and Paige Mosner. Both officers bring unique skills, experience and talents to the Police Department. Patrolman Richard Barbini, Chief James Blesson and Patrolwoman Paige Mosner.